It was the summer of 1953 when I became associated for life with polio.I had yet to reach my sixth birthday, so many of my memories are a bit sketchy. It seems I had been at a picnic that day playing on the swings and slides. As the day progressed I began to become ill. Upon returning to my home, my parents called by doctor, who still made house calls in those days. He had me immediately taken to Herman Kiefer Hospital for further examination. One of the most unpleasant memories of that day was the spinal tap that I was given immediately. I recall being physically restrained by large men, while that very painful process took place. The results of that test indicated I indeed had polio and dictated the beginning of many months of continuous hospitalization and treatment. I remember very crowded wards at Herman Kiefer with many beds in each. At first, I was totally paralyzed by eventually the paralysis settled in my right leg. Once the problem became more localized, I was able to get out of bed and, by wheelchair, move about the floor. With so many other boys around my age, it didn't take long to make friends and cavort with them. Wheelchair races and such activities kept us occupied, no doubt at the dismay of the staff. I do recall that there was not much self pity displayed by these patients. In fact I felt fortunate to not have been afflicted as badly as some others that I could see. Especially those imprisoned in iron lungs all day and all night without end. What I do not recall are visitors from outside the hospital apparently the result of being quarantined. Most of my stay there is in my mind a bit of a blur. Treatment and therapy appeared unending, punctuated by, what seemed to a young boy, huge needles and steaming hot wool wraps on my legs. Eventually, I learned to walk again, at first wearing a brace, eventually without. I guess that is when they sent me home. From the moment I arrived home, even though my home had stairs to get in and more stairs to reach the bedrooms and bathroom, I don't recall receiving or expecting any special treatment from my family with the stairs or anything else. I had a younger brother and sister, neither of whom contracted polio. I subconsciously adopted the attitude to "just deal with it". And from that point on, I did just that...dealt with it. From the time I left the hospital until my mid teens, I was in the care of a very capable osteopathic surgeon named Maurice Castle. An ongoing problem was a tight "heel cord" which, in the end, defied all attempts to correct, including a stretching process using plaster casting for several entire school summer vacations and the use of night bracing which was so painful it prevented sleep. Surgery was threatened at one point to cut the heel cord, but fortunately, that never happened. Other major treatment during those years became necessary as I aged. My affected leg began to become shorter than the other leg, leading to worries of eventual spinal malformations as I developed. The first attempt to correct this problem took place at nine years old. I underwent an as of yet unproven surgical procedure at Mt. Carmel Hospital during which a "pin" was placed in the growth center of my lower right leg intended to incite that leg to grow faster than the other. It was a success, at least for a while. By the time I became thirteen years of age, the difference in leg lengths had again became unacceptable. At that time the reverse procedure was used on my left leg to slow its growth. Luckily the combination of the two surgeries eventually prevented the spinal malformation. Those major medical procedures aside, I recall growing up quite normally, at least from my perspective. Associating with friends, going to school, learning life's lessons all seemed the same to me as it was to anyone else. Knowing my limitations, I just found was to do whatever I put my mind to do. Like any adolescent, I was self-conscious about appearing to be different from others. My biggest concern was that my affected leg was thinner than my normal leg. As a result, I spent many hot summers wearing long pants to avoid detection. But that and a minor limp when overly-tired were all that might have been obvious to others. I graduated from a Catholic all-boys college prep high school that stressed athletics. Being unable to play the sports I did the next best thing in order to participate and joined the school paper as a sports writer. At least I was able to ride the school bus with the teams to the games. Following high school, I graduated with a BS degree in finance from the University of Detroit, It was at UofD that I met the wonderful woman who became my wife of the last 40 years. We raised two great daughters who are both doing well. Although I have recently retired, mostly as a result of my Post Polio limitations, I had a 40 plus year career in executive management positions with three different companies which jobs did not demand much physical prowess. For the past five years I have been treated by Dr. Daniel Ryan at the St John Post-Polio Clinic. This has proven to be very helpful to me, and I truly wish I had begun seeing Dr. Ryan sooner. Had I done so, I believe i could have further slowed my increasing limitations. 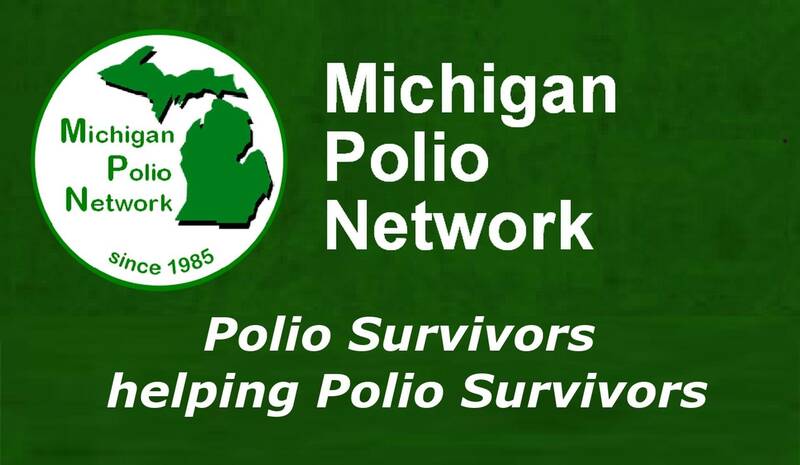 It was because of the Michigan Polio Network and Dr. Ryan's clinic, that I have finally met others with similar experiences. Basically, I went through life being unaware of knowing any one else who had also had polio. But then again most of us did not readily speak of our experiences either. While it took the better part of my first year of retirement to become accepting of what seemed the rather sudden need to end the stresses and efforts of continuing to work, I am now embracing this new lifestyle. My wife has been extremely understanding and has taken over many of the tasks that I can no longer handle. While physically constrained, I am finding ways to put my experiences and skills to use at activities that I enjoy. I feel quite fortunate to have been able to lead a near normal life for most of my years.